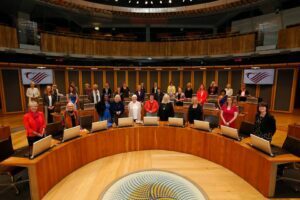 We are delighted to announce – and not a little overwhelmed – that the Honno founders are one of WEN Wales’s 100 legendary women, and attended the launch at the Senedd on the 8th May 2018. Honno authors and editors also on the list include Ann Pettitt, Ursula Masson and Deirdre Beddoe, and Classics authors Kate Bosse-Griffiths, Amy Dillwyn, Elizabeth Andrews, and Betsy Cadwaladr. Honno founders Rosanne Reeves, Sheleagh Llewellyn and Ceridwen Lloyd-Morgan along with Honno Committee member Nicky Herriot attended the event. More photos from the event will be appearing on our Facebook page. Our third Advent Friday offer is all about the Classics! 20% OFF ALL Welsh Women’s Classics and Clasuron Honno (English and Welsh) ordered at: www.honno.co.uk between the 15th and 21st December. Just apply the code xmas173 at checkout! And don’t forget we are giving £3 off advance orders of the ‘remarkable, arresting debut’ One Woman Walks Wales. All orders received before Christmas will receive £3 off and a personal printable email message from the author. Your copy will be posted to you on publication. (15th February 2018). Just apply the code owwwxmas. And please do spread a little love and share with friends and family! The UK’s longest standing independent women’s press is looking for an experienced project manager and administrator to manage its book production and office. 12 hours over three days @ £12.50 per hour + statutory entitlements. Closing date: 1st Debember 2017.